Protect your business with bollard sleeves and post covers from McCue. As a business owner, you know you need to guard your property, customers and employees from renegade vehicles. But forget ugly concrete bollards and pipe posts. Our durable bollard covers are easy to install, require no maintenance and look great. Request more information today! Bollard and post sleeves from McCue are made from impact-resistant polypropylene to provide you with maximum protection. All you have to do is slide them over your steel or concrete bollard or post and you’re up and running. Quality – Don’t keep repainting your bollards or pipes. Simply cover up the scratches, dings and defects. The standard yellow color stands out and is easy to see. Durability – Our bollard sleeves can take a beating and will still look as good as new. Simplicity – There are no special tools or complicated instructions needed for installation. Just slip them over your bollard or post. That’s it. You can easily remove them for cleaning, and they can be cut to size if necessary. We’ve been designing and manufacturing asset protection products since 1988, and our goal is to provide our customers with innovative solutions that protect from every angle. 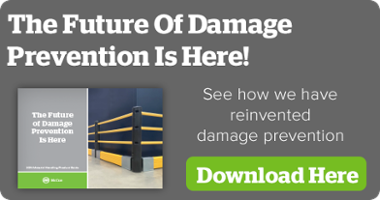 We understand the damage that can occur to stores and warehouses, and we’ve designed all of our products with that in mind. We don’t take bollards and bollard sleeves lightly … and you shouldn’t either! Contact us to start protecting your business today.